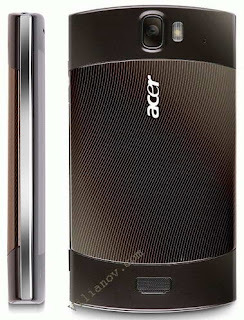 Acer spokesperson recently confirmed that their are planning to launch a new Android smartphone, named Acer Liquid Metal.According to him the new Acer Liquid Metal Smartphone hit markets of UK by end of October 2010. The new Acer Liquid Metal Smartphone comes equipped with a 3.6-inch WVGA multitouch screen and is powered with a 800 MHz Qualcomm processor.The smartphone has a 512 MB RAM and a 512 MB ROM Module.Other features includes Bluetooth 3.0 connectivity, and Dolby Mobile.The handset runs on Google Android 2.2 Froyo OS. Anyway the price of the new upcoming Liquid Metal Android smartphone has not revealed yet. Tags:-Acer Liquid Metal Smartphone features, Acer Liquid Metal Smartphone details, Acer Liquid Metal Smartphone specs, Acer Liquid Metal Smartphone launch, Acer Liquid Metal Smartphone release, Acer Liquid Metal Smartphone availability, Bluetooth 3.0 handset.